Heathcote National Park Mountain bike trails. 5 starts. Loftus Oval to Heathcote station in the Royal National Park offers some excellent mountain bike trails. There are plenty of fire trails and single tracks to explore. This section also combines extremely well with the Royal National Park basic loop if your after a longer ride. Mountain bike riding through the Royal National Parks offers well in excess of 30+ km’s to explore. These MTB trails are amazing and I highly recommend heading to Sydney’s South and check out the RNP. Royal National Park, Loftus to Heathcote Station Trail Head. Google Maps Link. The trail head can start at either Heathcote station or Loftus Oval. See the map below for entry points. If you just want to checkout top bottom half of the Royal National Park then Heathcote station is the way to go. The choice of single tracks and fire trails is excellent. You’ll be pushed to see it all in one day. As always there are some large hills to negotiate going both up and down to get that heart rate pumping. My fitbit goes off the chart. I highly recommend this MTB ride and give it 5 stars. Royal National Park Mountain Bike Trail Map. Distance: 24km with side tracks from Loftus oval. Royal National Park Mountain Bike Ride Photo Gallery. 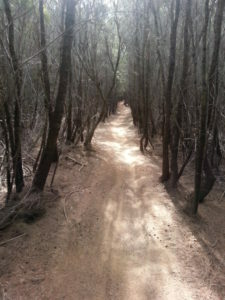 Mountain Bike, MTB, bicycle, track, trail, bush, dirt, ride, Sydney, South. heathcote national park, royal national park, mountain bike riding, mountain bike trails.